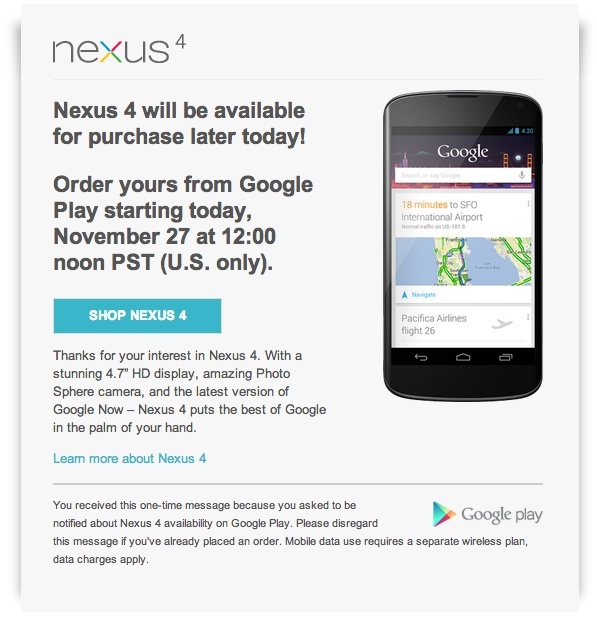 This morning, Google sent out a batch of emails with the headline “Nexus 4 will be available for purchase later today!” That’s right, the LG Nexus 4 will be back in stock and available for purchase for the first time in over two weeks since initial launch. At 12:00PM PST (3:00PM Eastern), you can order order directly from the Google Play store. Pricing should be the same at $299 (8GB) or $349 (16GB). We aren’t sure how many they will have, so get your credit cards ready. Do we think that Google has prepared the Google Play store this time around? If they are sending out emails like this, one would think they may have a better system in place or at least learned from some of the past mistakes. After the disaster that was launch day, it can only get better, right?